Add the vibrant yellow, small-cupped blooms of Martinette to the landscape and it will come alive with color and beauty each April without fail. 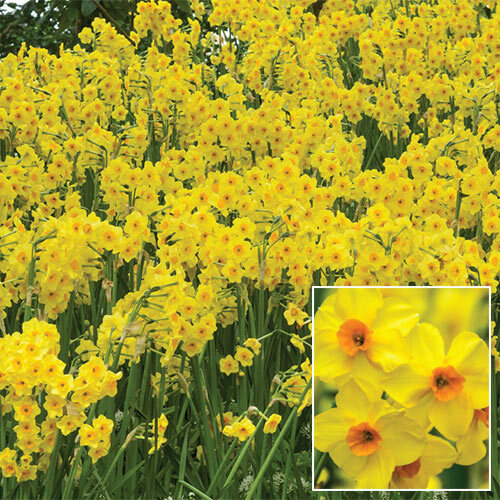 The pretty daffodils appear in multiples on strong 16" stems that don't drag or droop in the garden. Plus, Martinette is sweetly fragrant-their scent perfumes the entire area when in full bloom. They are perfect for adding lush color to seasonal borders, decorative pots and cutting gardens. Marinette naturalizes well, increasing in number yearly. Butterflies love these aromatic daffodils and will flock to the area, benefitting all the plants and flowers in the landscape. Plant plenty for the greatest impact.